Product information "HAIX Black Eagle Safety 52 Mid Brown"
You may be asking yourself, how is HAIX® Black Eagle® Safety Mid 52 Brown different than other comfortable safety boots? With the all new Black Eagle® Safety 52 Mid Brown, you can say goodbye to those uncomfortable and bulky safety shoes you've seen in the past. Black Eagle® is a light and comfortable safety boot - significantly more than other work boots! A great choice for parcel services, electricians, construction, warehouse, or factory work, the metal free design is perfect for high security work environments too. Black Eagle® Safety is quality crafted in Europe using fine European leathers. Built with the ASTM toe protection needed for on the job, but featuring the fit and feel of an athletic shoe. Black Eagle® comfortable safety boots are the perfect blend of athletic shoe technology and high tech safety features designed for the hard working professional. The carbon composite toe offers plenty of room for comfort and movement. Black Eagle® Safety provides maximum protection without sacrificing athletic performance. Black Eagle® Safety 52 Mid Brown will put an end to foot fatigue even when having to spend long hours on your feet. Protect yourself against slips and falls with the anti-slip technology of Black Eagle® boots. Not only do these brown safety work boots give you excellent grip on many surfaces, they are resistant to wearing down from abrasion too. Giving you longer lasting durability in addition to protection. Black Eagle® Safety is an ASTM certified pair of electrical hazard boots, too! HAIX® added a GORETEX® inner liner to the Black Eagle® Safety line so that you get complete waterproof protection no matter what the weather outside. The built in Climate System works to keep your feet dry and comfortable whether you are hot and sweaty or braving winter weather. Working in conjunction with the Climate System, the specially developed HAIX® insole is designed to wick moisture, is removable and machine washable, and antibacterial. 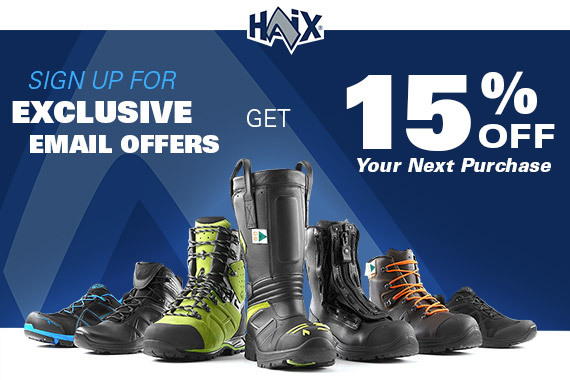 HAIX offers an Extended Wear Program, click here for more details. Related links to "HAIX Black Eagle Safety 52 Mid Brown"
Customer reviews for "HAIX Black Eagle Safety 52 Mid Brown"
Having a difficult time keeping them tight. But overall a great fit and comfortable. Haix makes great boots. These are no exception. They are true to size in length but do fit a bit narrow, so take that into account. They are a firm soled boot but when they form to your feet that is not a concern. Nice deep grooves for traction. A touch over 4 pounds in total weight for a pair of size 13 boots is great as well. Thanks Haix! Thank you for your review of the Black Eagle Safety 52 Mid Brown. We are happy to hear that you like your boots and they have been serving you well so far. These boots can run a little narrow in width but we are glad they seem to be working out for you. If you ever have any questions about sizing, please call our Customer Service Dept. or reach out via Live Chat. We are glad you appreciate the high-quality firm sole that also provides good traction. Thanks again for your comments. We hope you will continue to be a loyal HAIX customer in the future. A nice light weight boot. The boots are exactly like they were described:light weight,well made and comfortable. However,for walking over rough terrain they're hard on the feet and they could also use some ankle support. Hello and thank you for your feedback on the Black Eagle Safety 52 Mid Brown. We are happy that you found the boots to be well made as well as lightweight and comfortable. We are sorry that you think they are hard on rough terrain but that may ease up the more you wear them and break them in. The built-in arch support hugs your heels and offers support to prevent standing fatigue with pronation support in the mid and insole area to keep your ankles from rolling or twisting away from you. I apologize that you did not have this same experience while wearing them. We hope that you continue to give them a chance and and that they serve you better in the future.